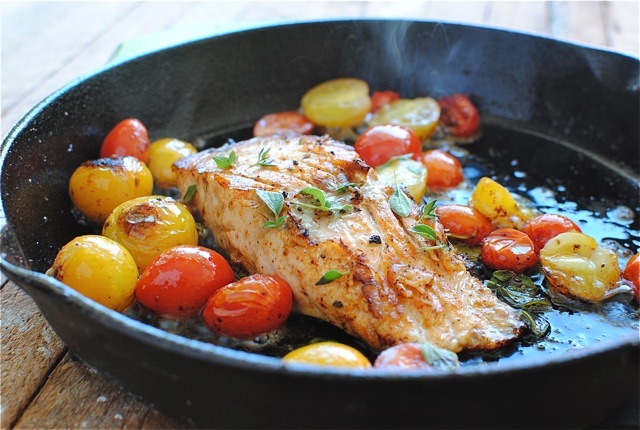 There is nothing that tastes like a pan seared salmon with fresh spices and cherry tomatoes. It stands alone as a savory meal with its flavor, natural vitamins and minerals. This Thanksgiving, instead of the heralded turkey, we are going to go for pan seared salmon. The recipe will include avocado oil, minced lemon, cherry tomatoes, cranberries, Old Bay spice, and carmelized onions. We may sprinkle some brown sugar and fresh herbs (parsley, basil, and tarragon) on the top, to add to the natural sweetness of the fish flavor. The cook time is surprisingly quick, as the fish is fully cooked in about 3-4 minutes, depending on the cut (I prefer fillets) and the thickness. Plus the fact that the fish continues to cook after it is removed from the heat, making sure the fish does not over-cook (and get dry) keeps the chef on her/his toes.